Fire accidents can happen in an instant. Without any warning, they can destroy all your belongings and worst of all, take away your life. As such, it would be wise for you to install essential fire protection devices to protect your commercial property and your employees from the devastating effects of fires. One effective yet inexpensive way for you to protect yourself and your workers from fire accidents is installing fire sprinklers within your building. A well-installed fire sprinkler system can effectively knock down fire before it goes out of control. The way a fire sprinkler works is very simple. However, its simplicity is also the key to its effectiveness. All fire sprinklers have sensors that detect heat from fires. Once the sprinkler detects that a fire is occurring, it releases an adequate amount of water to extinguish it. Through this way, fires are knocked down before they can spread to the other rooms of your building and cause damages. Installing a sprinkler system in your property is far more effective than only having a fire alarm. Indeed, fire alarms are perfect for alerting your people that a fire is occurring. The only problem is that they do not do anything to extinguish it. On the other hand, sprinkler systems automatically extinguish a fire when they detect smoke or heat. However, this does not mean that you should not buy fire alarms. It would be best for you to strengthen the fire protection system of your building by acquiring both fire alarms and sprinkler system installation. Furthermore, what makes fire sprinkler systems essential components of your property’s fire protection system is that they minimize the risk of inhaling deadly smoke. Many people die not because of getting burned but because they inhale a tremendous amount of deadly smoke even before they can get out of the building. Smoke is very dangerous. If you inhale an excessive amount of it, you can get dizzy and worst of all, become unconscious. When you install a sprinkler system in your property, you reduce the risk of you and your workers inhaling toxic smoke caused by a fire. Fire sprinklers release water that breaks down the deadly particles of smoke. Through this way, you reduce the probability of you getting unconscious due to excessive smoke inhalation. When it comes to providing protection to your employees and property against the devastating effects of fires, nothing beats fire sprinkler systems. A fire sprinkler can effectively stop fire before it gets worse and reduce the risk of inhaling deadly smoke. The best part is, fire sprinklers do not cause a fortune. They are inexpensive yet highly effective in protecting your building and people. If you are looking for high quality sprinkler system installation, then look no further. 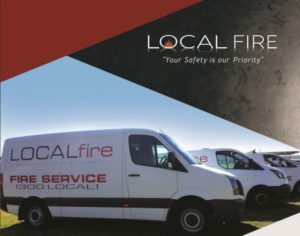 Local Fire is your one-stop shop for all your fire protection needs. We offer high quality fire sprinkler systems that are durable and dependable. You can count on our fire sprinklers to protect your property in case a fire occurs. If you want to learn more about installing sprinkler systems, call us today.